The LinkedIn 2018 Emerging Jobs Report says artificial intelligence (AI) is here to stay. However, it also states basic business functions are surging, adding technology can’t replace the power of humans. 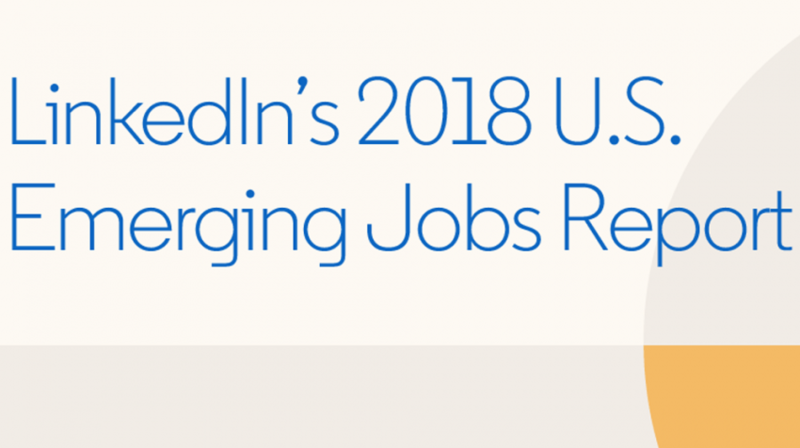 This LinkedIn report is put together so professionals and businesses in the US can take a peek at the jobs and skills which are growing the most rapidly. 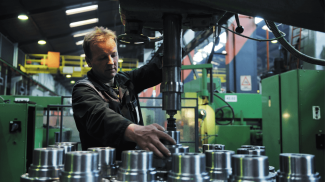 Additionally, the report analyzes the roles which have emerged over the last five years and the skills associated with them to determine which companies are hiring. 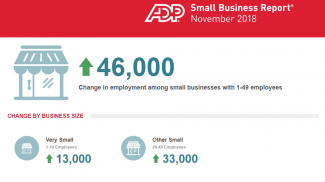 The information the report provides gives small businesses valuable insight into the job market across a range of industries in US cities. 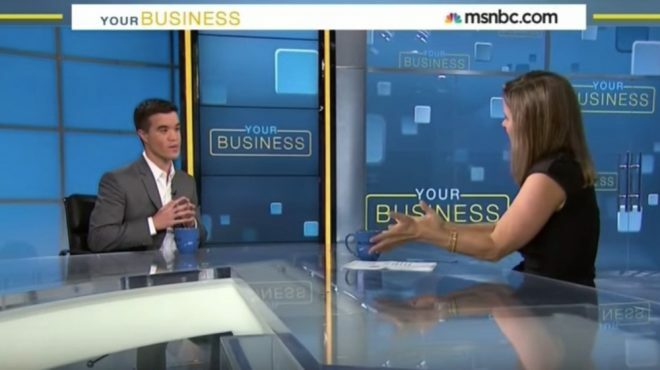 Business owners can use the data to prepare for upcoming trends in their industry and identify opportunities in locations which may be underserved. The report says AI skills are amongst the fastest-growing skills on LinkedIn with a global increase of 190% from 2015 to 2017. Although LinkedIn says AI is here to stay, it doesn’t quite see robots coming for your job. But there is continued growth in the field along with functions related to AI. With six of the 15 emerging jobs related to AI in some way, there is no question the impact will be huge moving forward. And the report says it is not just limited to tech, AI is infiltrating every industry. The growth of AI is undeniable, and the full impact of the technology will not be truly known until it has fully matured. In the meantime, basic business functions will be carried out by humans. In the report, operational functions like administrative assistant, assurance staff, and sales development representative are also in the emerging jobs list. When it comes to the largest skills gaps, soft skills still continue to be a challenge for companies looking to fill these positions. These are skills such as oral communication, leadership, and time management. Currently, they make up almost half the list of skills with the largest skills gaps. LinkedIn says it is imperative for professionals to acquire these skills because those who have them will have a leg up on their competition. The emerging jobs LinkedIn identified in the report are in “incredibly high demand” across the country covering industries from healthcare to government services. The growth comes from existing members who added these roles to their profiles covering a variety of business functions and skills. 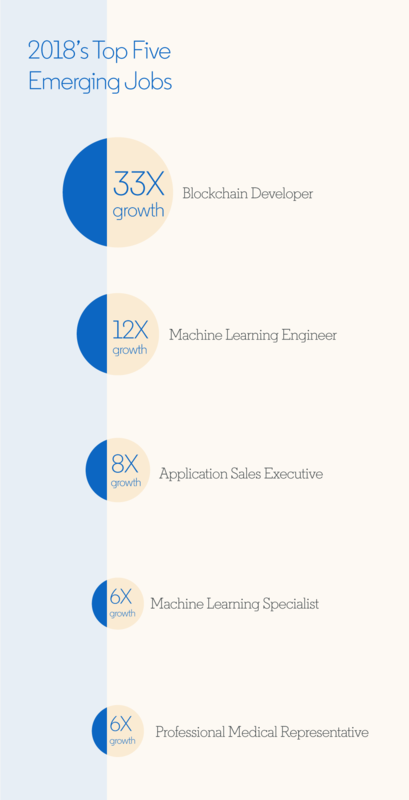 In this year’s report, the biggest top five growth comes from blockchain developer (33X growth), machine learning engineer (12X growth), application sales executive (8X growth), machine learning specialist (6X growth), and professional medical representative (6X growth). The top five emerging jobs starts with software engineer (80,000+ job openings), account executive (16,000+ job openings), realtor (2,000+ job openings), account manager (17,000+ job openings), and recruiter ( 8,000+ job openings). The report says the biggest shortage in skill gaps in almost every city in the US was oral communications. The rest of the skill shortages are people management, development tools, social media, business management, time management, leadership, graphic design, data science, and web development. In 2017 LinkedIn members in the US classified 26% of all skills as interpersonal or soft skills. Whether it is a systems engineer or a project manager, companies looking to fill these positions want their candidates to have soft skills. Interesting that the LinkedIn Emerging Jobs Report shows that oral communications and soft skills are the biggest job gaps. Hence, becoming an engineer is what they talk about but the real winners will be project managers and business managers in the AI development space. This is a pretty typical trade off, where the engineers tend not to have strong communication skills but the combination of technical knowledge, in a growing field, and communication skills, is a ticket to extreme success. Soft skills are more important than ever because of the distributed workforce in today’s digital ecosystem. If you have a team working across city, state, national, and international borders, effective communication skills are essential. Not surprised to see AI/Machine Learning on these lists. Same for blockchain-related skills. Those are both growing fields.